CAFÉ is a pet food assistance program for low-income or fixed-income families and individuals. 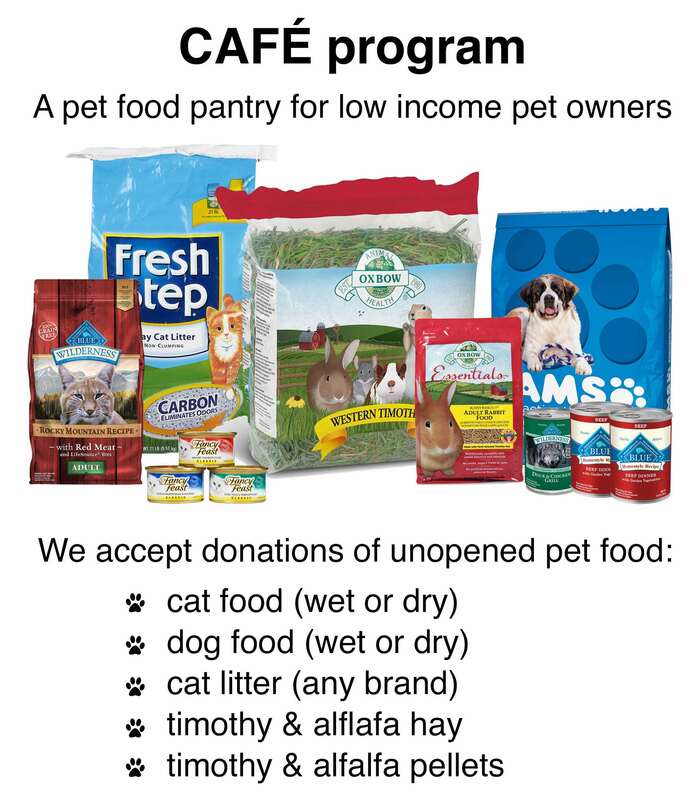 CAFÉ can provide between 7 to 10 days of cat or dog food per month to help clients keep their pets despite financial difficulties. This program is not intended to provide all the food necessary to sustain a pet; rather, CAFÉ offers a supplement to help in difficult times. Clients must show proof of their low-income or fixed-income status. This includes Social Security letters, Unemployment Awards letters, Disability Award letters, Medical cards, etc., plus proof of address. All animals belonging to clients must be spayed or neutered and clients must provide verification. Individuals who meet these requirements are eligible to receive food once a month through CAFÉ. Food is distributed the last Friday of the month, 1 p.m., at Howard Area Community Center [www.howardarea.org], 7648 N. Paulina, Chicago. New clients may sign up for CAFÉ on that last Friday at Howard Area Community Center.